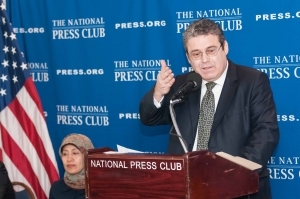 Ufuk Gokcen, Permanent Observer to the United Nations, discusses human rights issues at a National Press Club Newsmaker, December 13, 2011. Making its first appearance in the nation’s capital Dec. 13, the newly established Independent Permanent Human Rights Commission of the Organization of Islamic Cooperation outlined its priorities for improving human rights of women and children. The OIC, which claims to be the second largest intergovernmental organization after the United Nations, includes as members 57 states on four continents and the Palestinian Authority. Formed more than four decades ago following the burning of a mosque in Jerusalem, it set out to protect Muslim values and change the perceptions that the group says has led to violence and discrimination against Muslims. The organization has drawn criticism for its approach to religious tolerance which has been viewed in the United States as an attempt to suppress freedom of expression. As the first formal Muslim body focused on human rights, the commission views itself as an advisory board that will report to the organization’s Council of Foreign Ministers. Its broad mandate, said OIC Gen. Secretariat Rizwan Saeed Sheikh, is to create a legal foundation to deal with the whole body of civil, political, economic, social and cultural rights as they are known to the world today. That’s a crucial point he said, because association with the OIC suggests in some quarters that the commission is a religion-oriented effort. It is not, he noted, saying OIC is a political organization that uses political means to achieve its goals. But the guiding principles for the commission’s work is human rights, as known and practiced universally. He said numerous issues, including child labor, women’s rights and the use of children in armed conflict, will be addressed by the body.